With about one in three of us earning at least some of our income as freelancers, it can sometimes feel a little crowded out there in the freelance world. And let’s not forget about the seemingly endless cycle of feast or famine — one week, more work than you know what to do with. The next week? Nothing! The good news is, as more companies, startups, and busy professionals look for online help there are more and more ways to earn as a freelancer. But where, exactly, are these potential clients connecting with freelancers? It depends. Some find freelancers by word of mouth. Others turn to social media. And some sign up as clients on various freelance websites. It’s these freelance websites, in particular, that can seem like a foreign landscape if you’ve never used them before. And as someone who has turned them many times as both a client and a freelancer, I can attest that not all freelance websites are created equal. So, whether you’re a beginner looking to dip your toe in the freelance waters, a seasoned pro looking to find your next favorite client, or a side hustler looking for a gig or two a month, you may actually find what you’re looking for on the different freelance websites out there. Freelance Websites – What Are They, Exactly? As I mentioned earlier, not all freelance websites are created equal. Each has a different modus operandi — and, as such, you’ll love how some operate and absolutely hate how others go about doing business. You’ll quickly find that your way of freelancing better aligns with one freelance site over the next. And that’s okay. For example, I’ve never had any luck as a freelancer on Fiverr (not for lack of trying!) while others have found six-figure success on this well-known $5-gig site. Then there’s mega-marketplaces like Upwork that some freelancers count on for full-time income while others thrive in competition sites like 99designs or Freelancer. Really, the freelance website you gravitate towards will depend on your skills and how you like to work. Period. So, I’ve rounded up a diverse selection of five very different freelance websites to help you figure out what you’re getting into as a freelancer before you get into it. You’ll either love Upwork or hate it. There seems to be no in between for most freelancers. Me? I have a love-hate relationship with the site as I’ve used it as a both a freelancer and a client. Feeling aside, what I can attest to is this: There is a lot of work available on this site! Think about this: More than 1 million businesses turn to Upwork to find freelancers, like you, to work on everything from data entry to design work. Dropbox, Airbnb, and zendesk are just a few of the well known businesses that use Upwork to find freelancers. In total, more than 3 million gigs are posted here each year which amounts to more than $1 billion worth of contracts! Pretty impressive, right? That’s why Upwork wins the title of most active of all the freelance websites on the list. It truly is the mecca of freelance marketplaces. But just because it’s the biggest, doesn’t make it the best. There are, however, some things to consider before diving into the deep end of the Upwork pool. You can sign up as a freelancer for free! You’ll create a profile that clients can see. This is where you can show off your portfolio and brag about the amazing work you’re known for. Once you’ve filled out your profile, you can start pitching to gigs that pique your interest. With the free account, you’ll get 60 connects per month. Each pitch you send out will “cost” you a couple of connects. Sometimes you’ll get the gig. Sometimes you won’t. There can be a lot of stiff competition! When you are rewarded a gig, you’ll hand over a percentage of your earnings to Upwork. The percentage changes based on how long you’ve been with a client and how much you’ve worked for them — long-term projects with higher revenue are rewarded with lower fees. You can receive your earnings via PayPal or direct deposit — the choice is yours. The number one pro of Upwork is the sheer volume of work available. On the flip side, you’ve got to do a lot of pitching in order to land gigs. And pitching can take time — a lot of time. There’s also a lot of competition on this site. And sometimes, clients aren’t looking for top talent. They’re simply looking for the lowest bidder. And when you factor in fees as high as 20%, it can feel like you’re working for next to nothing if you’re not careful. If you’ve perfected your pitch and don’t mind a little competition, you can find tons of success on Upwork. But if you just hate the idea of tailoring a unique pitch to each gig that piques your interest, you may want to move on. I’m serious when I say you will spend a ton of time perusing gigs and pitching to potential clients. FreeeUp is the newest of the freelance websites to make it on this list. But since launching they’ve seen tremendous growth and have a pretty impressive lineup of clients that include both big-name businesses and single sellers in the world of eCommerce. This includes everyone from Amazon and eBay sellers to large online boutiques and familiar brands. Since the majority of their clients are online sellers, FreeeUp looks for freelancers with talents that translate well to eCommerce. Some of the skills they seek include data entry, customer service, SEO, marketing, and graphic design. They also are interested in hearing from freelancers with experience in popular selling platforms like Amazon, Ebay, WordPress and Shopify. On average, only about 1% of freelancers make it through their hiring process — but don’t let that discourage you. If you have the talent combined with the open communication needed to work with clients, you may be rewarded with a steady stream of work — no pitching required! That’s right. FreeeUp reviews clients’ needs and pairs them with the perfect freelancer. This means you can spend less time pitching and more time earning, win-win. On the flip side, being a freelancer on FreeeUp means you’re limited to whatever gigs are assigned to you. This means if you don’t have any work, you’ll have to go elsewhere to find it. But as FreeeUp continues to grow their client base, it means more jobs and steady work for freelancers. Unlike Upwork, where anyone and everyone can sign up to freelance, CloudPeeps makes freelancers apply to join their platform. This ensures you have the right skills to meet their clients’ needs. It also helps build a community of freelancers who are dedicated to their craft and are passionate about remote work culture. While all types of freelancers are welcome, CloudPeeps is particularly interested in hearing from freelancers with design, development, PR, marketing, content marketing, and social media backgrounds. Before you become a Peep, you’ve got to go through the application process. Again, CloudPeeps looks for motivated freelancers who are self-starters. Typically, they seek Peeps with native level proficiency in English and previous work experience in the areas previously mentioned above. Most applicants will know within 24 hours whether or not they’ve been selected to become a Peep. From there, you’ll get the chance to create a profile and set up a Storefront. This means that, in addition to pitching to posted jobs, you have the opportunity to sell your services directly to clients — a feature unique to CloudPeeps! As a Peep, how often you’re paid depends on whether your job is hourly, fixed, or a one-time project. Either way, Peeps can receive their payments via PayPal or direct deposit. I like that CloudPeeps gives freelancers a chance to set up their own Storefront to showcase their talents and receive direct orders from clients. Freelancers get tons of autonomy while using the CloudPeeps platform but are still able to escalate any issues directly to CloudPeeps if needed. But there is no guarantee that you will pass the application process and, even if you do, you still have to pitch to gigs to find work. However, if you pitch well and sell yourself through your Storefront, you can easily find enough work to keep you busy. If you think you can’t make a living on the famous $5-gig site — think again! There are many sellers making a comfortable six-figures selling gigs here. In fact, there are countless Fiverr seller success stories like this one, this one, and this one! And it’s easy to see why sellers can be successful freelancers when the Fiverr platform is so popular amongst buyers. For as little as $5 you can buy everything from a polished logo to creative content and keyword research — and that’s just a small sampling of some of the mainstream gigs. There’s even some unique and downright strange gigs to be found here. And that’s what makes Fiverr great — you really can make a living doing whatever it is you enjoy. It’s a common misconception that you have to always sell your work on Fiverr for $5 — but that couldn’t be further from the truth. Yes, you do have to offer at least one basic $5 gig but most sellers earn the big bucks when they create gig packages and add-ons. For example, let’s say you’ll write 150 words of content for $5. To complement this offering, you can sell an additional 400 word for ten more dollars. If time is of the essence, you can offer 24-hour turnaround for another $15. By the time all is said and done, you’ve just earned $30. But really, it all starts with a stellar seller profile. Instead of pitching to gigs, customers come to you. How? Your seller profile. This is where you’ll sell your gigs, represent your skills, and tell your story of what makes you the best freelancer for a gig. When clients like what they see, they’ll purchase your gig and you can get to work. Fiverr does take a 20% cut of your earnings — so if you’re selling something for $5, you’ll net $4 of it. Once a gig is complete, the buyer reviews it and accepts the work. That’s when you’ll get paid. Not having to endlessly pitch your services to clients means you can focus more on getting work done (which means more money!). And it’s also a bonus that freelancers get to set up different gigs and offer add-ons that can take a $5 gig to a $50 one. But there’s definitely a learning curve when it comes to selling on Fiverr. It can take some time for your first gig to roll in. Even still, the amount you earn will be based on how well your gig performs on this super crowded marketplace. But if you perform great work and are priced competitively, you can find a consistent stream of orders in your Fiverr seller’s queue. At last count, LinkedIn had a reported 450 million users! And while it’s no secret that many use this social platform to network and find jobs, it’s not widely known as a way for freelancers to find work. Enter LinkedIn ProFinder. Launched in October 2015, ProFinder was specifically built to assist independent LinkedIn professional users connect with companies seeking top freelance talent. Design, writing, coaching, photography, wellness, and administrative are just some of the most requested services on ProFinder (you can view a full list here). And what’s unique about ProFinder is you get to work on projects in your local area. First things first, you’ll need to sign up as ProFinder Pro. After that, it’s time to pen an eye-catching profile that sells your services! Your profile is the first thing potential clients will see, so you need to make it shine — don’t forget to include a warm and welcoming profile picture. Note: Your LinkedIn profile and ProFinder profiles are connected. Any changes you make to your LinkedIn profile, will be reflected on your ProFinder profile! When a LinkedIn member decides they need a freelance pro, they’ll submit a request. If your skills and experience are the right fit for the gig, LinkedIn will send you an email to let you know about it. It’s up to you respond to requests with a short proposal. (You’re not obligated to respond to requests.) Once the client thinks you’re a good fit, they’ll reach out to you and start a conversation. That’s it. From there, it will be up to you and the client to establish the terms of the gig. For those freelancers active on LinkedIn, ProFinder can help boost your visibility — quickly. And since leads are delivered directly to your inbox, you don’t have to endlessly cold pitch to gigs like you would on many large marketplace sites. Plus, if you live in a bigger metropolitan area, you’ll likely find a lot of in-person work requests — definitely a bonus for the social freelancer! But if you’re a newbie on LinkedIn, it can be difficult to establish yourself as an expert freelancer. Lack of recommendations can keep you from getting your first gig. Fortunately, you can ask for recommendations and use the LinkedIn publishing platform to boost your visibility — and your chances of getting hired. Remember, as a freelancer you don’t have to limit yourself to one platform. You can use any combination of sites to make ends meet. Plus, the more you explore, the easier it will be to figure out which of the freelance websites is the best fit for you. What are you waiting for? Figure out which services you’ll offer and get to work! Now is a great time to be a freelancer. 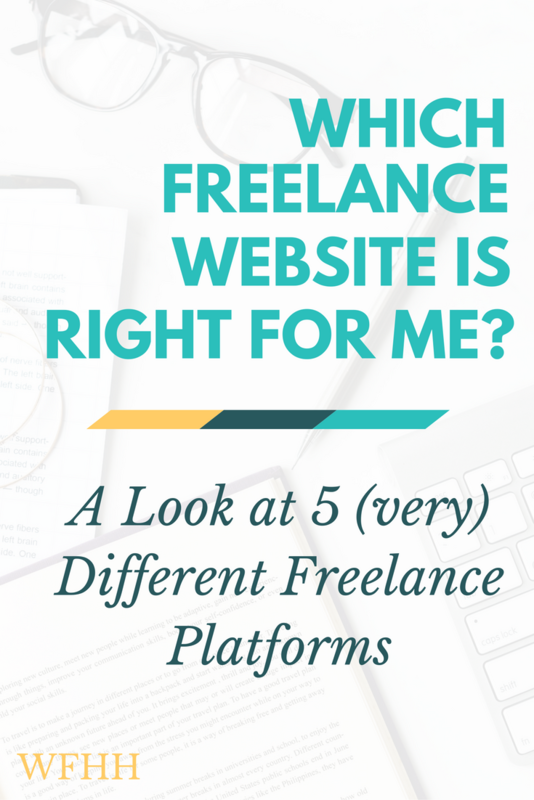 The post Freelance Websites: 5 (Very) Different Platforms to Find the Right Gigs for You appeared first on Work from Home Happiness.